Is Oatmeal a Good Breakfast for Weight Loss? In the morning whirlwind to get ready and out the door, it can be hard to find time for the picture-perfect healthy breakfast you may want to eat, but breakfast doesn't have to be fancy to help you lose weight. Oatmeal comes together in just a few minutes, and it's ideal for weight control for you and your family. Plain oatmeal is low in calories and high in fiber -- a winning combination for helping you drop those extra pounds. Oatmeal's creamy taste and stick-to-your-ribs texture make it seem like an indulgence, but it's actually relatively low in calories. A cup of cooked oatmeal, served plain and made with instant oats, has 159 calories, which come from its 27 grams of carbs, 5 grams of protein and 3 grams of fat. Beware flavored, pre-packaged oatmeal, though. One packet of a leading commercially-prepared apple cinnamon oatmeal has 157 calories in a small serving size that's likely to leave you hungry by mid-morning. Gram for gram, flavored oatmeal has almost 6 times as many calories as plain oatmeal. Oatmeal's major weight loss benefit comes from its fiber content. Although fiber is a type of carbohydrate, it doesn't break down into sugar like other types of carbohydrates. Instead, it absorbs water to take up space in your stomach, which also helps fight constipation. Getting 30 grams of fiber each day puts you on track for weight loss, according to Harvard Health Publications. It also offers other benefits, including lower blood pressure, which protects heart health. A cup of cooked oatmeal has 4 grams of fiber, or 13 percent of the 30-gram goal. Some of this fiber comes from soluble fiber -- a form that's especially good for fighting belly fat, according to Wake Forest Baptist Medical Center. Oatmeal's reputation as a diet food isn't just buzz -- there's evidence to show that eating it for breakfast could help you lose weight. 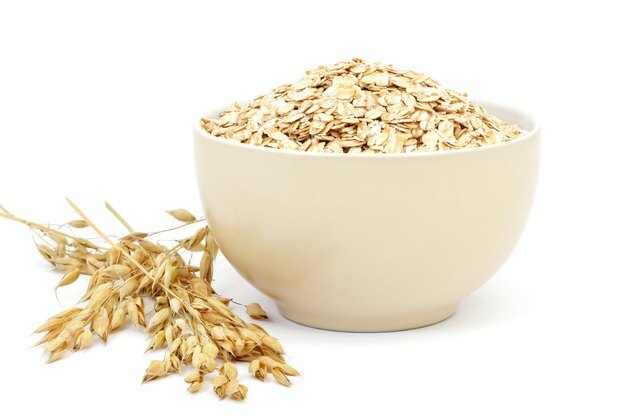 A 2015 study in the Annals of Nutrition and Metabolism compared oatmeal to corn flakes to learn more about oatmeal's potential to help with weight loss. The study's authors fed 36 study subjects -- half of whom were overweight, and half of whom were lean -- either corn flakes or oatmeal, to see how each cereal affected appetite. They found that the people who ate oatmeal for breakfast felt fuller for longer, and they ate less at lunch, than the ones who had eaten corn flakes. Those results were especially pronounced in the overweight test subjects, which hints that oatmeal might be especially good if you're trying to achieve a healthy weight. However, since this study only looked at a few dozen people, more research is needed to know exactly how much oatmeal helps. There's also some evidence that oatmeal may offer weight control benefits for kids. A 10-year study, published in Food & Nutrition Research in 2015, found that kids who eat oatmeal are more likely to maintain a healthy weight and tend to have higher overall diet quality than those who don't. While this doesn't mean that oatmeal alone directly fights childhood obesity, it does highlight oatmeal as part of a healthy diet. Avoid monotony -- and make your oatmeal kid-friendly -- by using healthy mix-ins. Topping your oatmeal with fruits like chopped apples, pears or a handful of berries adds natural sweetness while also boosting the fiber in your meal. Make oatmeal feel like a treat by mixing your oats with pureed pumpkin, pumpkin pie spice and a handful of chopped pecans. or make "apple pie" oatmeal by topping your oats with sugar-free applesauce and a dash of cinnamon. Experiment with different textures to keep oatmeal interesting. Go for baked steel-cut oats on the weekends when you have some extra cooking time, or make "overnight oats" by letting your oats soak in almond milk overnight for a fast breakfast that doesn't require any morning prep. Food and Nutrition Research: Cooked Oatmeal Consumption is Associated with Better Diet Quality, Better Nutrient Intakes, and Reduced Risk for Central Adiposity and Obesity in Children 2-18 Years: NHANES 2001-2010. How Does Oatmeal Help Burn Fat? Is Eating Cereal at Night Healthy?